The Teacher Educator Technology Competencies (TETCs) create a common language for teacher educators surrounding how to help teacher candidates learn how to use technology in their future classrooms. Foulger, T. S., Graziano, K. J., Schmidt-Crawford, D. & Slykhuis, D. A. (2017). Teacher Educator Technology Competencies. Journal of Technology and Teacher Education, 25(4), 413-448. The TETCs were developed to support the redesign of teaching in Teacher Education. The call to action is clear: “There should be no uncertainty of whether a learner entering a PK–12 classroom or college lecture hall will encounter a teacher or instructor fully capable of taking advantage of technology to transform learning. 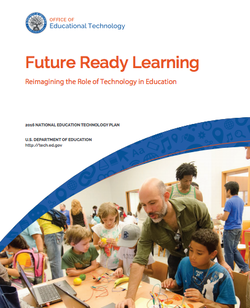 Accrediting institutions, advocacy organizations, state policymakers, administrators, and educators have to collaborate on a set of clear and common expectations and credentialing regarding educators’ abilities to design and implement technology-enabled learning environments effectively" (p. 37). The TETCs were developed based on the vision that ALL preservice students can be proficient in teaching with technology, and ALL teacher preparation faculty should be prepared to address this need, no matter what course they teach. The development of the TETCs involved many teacher educators who supplied articles and opinions through a highly collaborative processes involving the crowdsourcing of literature, a Delphi process, and public vetting. For full details, please refer to the article noted at the top of this page.